Established in 1965 by local artists, the Santa Barbara Arts and Crafts Show was inspired by the sidewalk art shows of Europe and the prestigious “Jardin del Arte” in Mexico City. Sponsored by the City Parks and Recreation Department since 1966, the show is now the only continuous, non-juried arts festival of original drawings, paintings, graphics, sculpture, crafts and photography in the world. Whatever the size, subject, media and price-all are original art; done by the artists you meet. Approximately 200 Santa Barbara County resident artists display their own original work in an informal atmosphere that encourages visitors to the show to talk with the artists about their work – and in some cases even to see them in action. 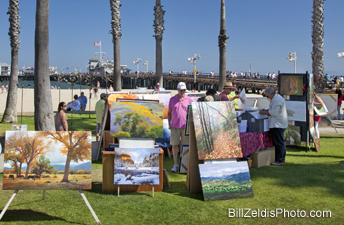 The Santa Barbara Arts and Crafts Show enjoys a beautiful beach setting under the palms along Cabrillo Boulevard east from State Street/Stearns Wharf on all fair weather Sundays and holidays. For more information, please visit our website. Administrative Offices are located at the Carrillo Recreation Center, 100 East Carrillo St., Santa Barbara, CA 93101, open Monday-Friday, 9am-5pm.